Tomorrow I begin the long journey to France. First a day in Portland in order to properly say goodbye to my husband. Then 3 flights, landing in Marseille. To be honest I'm not excited about the travel part, but I'm beyond stoked about seeing France for the first time! 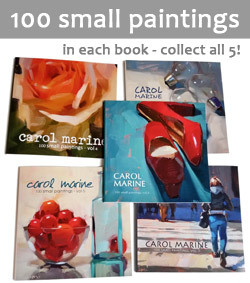 We've got a great group lined up, and some exciting places to paint! Unfortunately this means I won't be able to ship any paintings until after I return (May 20th). I apologize for the inconvenience. i hope we will see you in Strasbourg, have à nice trip. 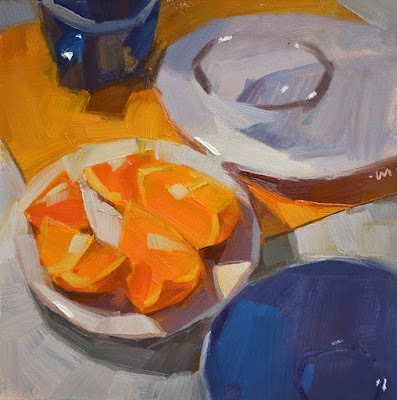 Love the small triangle shaped area of light on the dish with oranges. Can't wait to hear about your trip, have a wonderful safe time.